While most runners in Chicago are now firmly focused on marathon training, I’ve been focused on TRI training. My life is swim, bike, run, repeat. Swim, bike, run, repeat. This means I have actually been running less than “normal”. My miles are down. In a sense, I’ve been in cross training mode, very unworried about how far or how often I’m running. However, even I have now downloaded a training plan, ran my first workout, and am beginning to think about the fall running & racing season. One thing is for certain, long hard miles in the summer bring fast times in the fall. Where do I want to run fast? 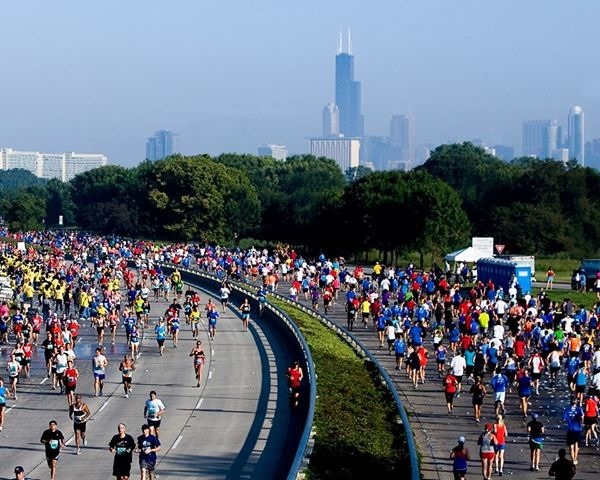 The Chicago Half Marathon on September 8, 2013. While half marathons are now popping up everywhere, we still have a solid few that survive on reputation alone …. not gimmick, or hype, or a promise of a “good time” but rather a solid race that offers a fast & flat road race that brings the serious competitor and first timer alike. One such race, is the Chicago Half Marathon, in Jackson Park, in Chicago. It’s always the second Sunday in September. It’s always the best race Chicago offers in September. It’s always the premier half of the entire fall season for Chicagoland. The Chicago Half was my first ever half marathon and one which I continue to return to year after year. This will be my goal half marathon for 2013 and the one where I won’t run safe and smart but with my heart on my sleeve, pushing with everything I have in my tank on that given day. Plus it’s a Southside race and although I’m not born & bred Chicago, I am a Southsider now and love any race that doesn’t force me to travel all the way downtown. Course map (from 2012 because the website is currently having technical issues from the storms, but it’s always the same) shows a run thru Jackson Park then a balls out fast race on Lake Shore Drive where you can see your fast friends and those behind you too! 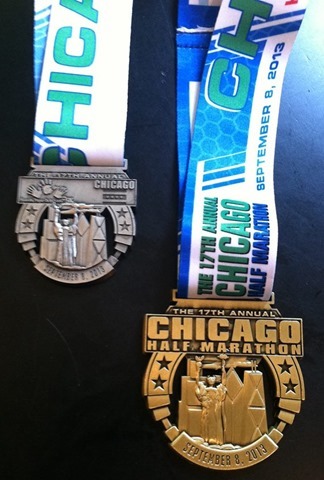 If you’re in it for the bling, here is a sneak peak at the medals for the 5K and the Half, plus the Windy City Challenge medal for those who plan to double up and run both the 13.1 Chicago event (which occurred on June 8th) and the Chicago Half on September 8th. Now, I know you want to run but I also know that race entry fees stack up fast so US Road Sports is offering a free entry to one reader. To enter this giveaway, comment below and tell me which is your favorite Chicago area half marathon. I’m going to be super picky next year and select only a few quality races, so I need to know which one is your favorite so I can narrow down my choices! Giveaway is live NOW and will run til Monday, July 1st at 9am when I will select one winner via a random number generator. Good luck! This entry was posted in Giveaways, Running and tagged best half marathon in Chicago, Chicago Half Marathon, Chicago Half Marathon Giveaway, fast and flat half marathon in Chicago, Free Entry to Chicago Half Marathon, giveaway to a half marathon in Chicago, Great Chicago Half marathon, half marathon giveaway, race medals for the Chicago Half, Run Jackson Park, run on Lake Shore Drive, Windy City Challenge by tootallfritz. Bookmark the permalink. Chicago half marathon is by far my favorite half marathon. Melissa and I will return every year as it is our yearly weekend get away. We both set PR’s there last year. Im hoping to go under 1:30 for the first time there this year. If I won I would give to my friend Christina so her and her husband John could go with us for a couples weekend. Pick me Amanda..I need it for Marathon training!! I grew up in Chicago and live to come home to run. I choose not to do the marathon this year but would love to come home to run the 1/2. The lakeshore is one of the most beautiful places to run. I would love to run the Chicago half-marathon!! Good luck with your training!! Good luck! I would love to run the half! It would be great training for the full in October! I haven’t run this half yet but I agree with you – less hype, more quality is what makes a good race. I enjoyed the Chicago Spring Marathon because it was a small crowd and the full catered breakfast afterwards was a nice perk. It’s been a long time since I’ve run a half marathon in Chicago. But a standout race was the HalfMadness Half Marathon in Batavia. Nice course, semi-challenging course and excellent beer spread afterward. Can’t complain! I really love that 13.1 cause it is far less congested and the post-race festivities far better at that S-Shore Cultural Center. The Chicago Half just way too big for me. 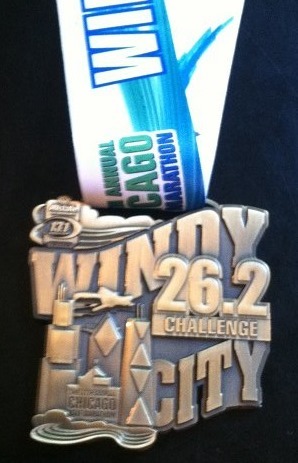 But…that Windy City 26.2 challenge sounds like a cool bling to pursue. I had fun with you at the Allstate 13.1, I would love a chance to run with you again!! I have done two halfs, Palos and Allstate, I would say that I liked the Palos Half better than the Allstate, only because Palos was an easier run for me!! I have run the Chicago Rock-N-Roll every year since inception and while the course was not my favorite the first two years, it’s much better as the race grows and the organizers gain more support from the city. The course follows more city streets; which I love. I also enjoy the local bands along the course. I did run the Chicago Half two years ago and would love to do that one again this year as I prep for my marathon! Thanks for making this opportunity available. The Oak Brook Half was really pretty, but so hilly. I haven’t ran any of the Chicago races, but would love to try the Chicago Half! And that bling is sweet! I haven’t run this half in a few years. It does fit nicely into the training plan for Grand Rapids Marathon on 10/20. I have two, the Oak Brook Half Marathon and the First Midwest Southwest Half Marathon. So far Mel’s half in palos has been my favorite. Out of my four half marathons I’ve done two have been out of state. Chicago Half Marathon!!! … Beautiful course with some pretty great people 🙂 Plus, it will get my to my goal of 4 in 2013. The only half I’ve done is the First Midwest in Palos. I would love to do this one! I actually have never done a half marathon, officially. I run nearly 20+ miles every week working on building endurance. 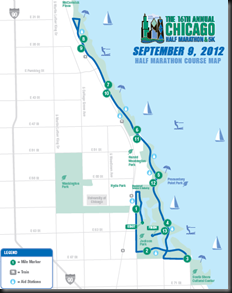 On July 21st, 2013 I will be taking part in the Chicago Rock n’ Roll Half Marathon. I have fallen in love with not just running but enjoying a fit/healthy lifestyle. It would be such an accomplishment to not only run one but two half marathons in the same year. I have high hopes to someday run the Chicago Marathon, too! Rock-N-Roll Half is the only one I have done and it was nice – a little hot, but this one looks awesome and would get me something on the schedule to shoot for. I really enjoyed the women’s half last weekend besides the blasting heat. I thought it was well run. I really don’t have a favorite! It seems like this race is EVERYONE’S favorite half! I have to try it eventually. If you forced me to pick one I would say the Naperville trails half! The Chicago Half is a great race, but my favorite is the Palos Half. Thanks for the opportunity to win an entry! Palos Half marathon – Great out and back course in the forest preserves – tons of water stations – Race clock at every mile – the LaGrange flyover coming back is a solid “test your training” hill – Plus they do a ton of charity work and the beer tent afterwards is pretty solid. Me me me…. This would be awesome. Never done a 1/2 but would love to and as you know, would love for Chicago to be my first! The Chicago Half marathon was my first ever half as well so it will always be my favorite: great crowd support and beautiful views of the city. This would also be my first half marathon ever, and I am hoping it will become my favorite! I am moving to Chicago in August and feel this would be a lovely way to see the city. My current favorite half marathon is the Palos Half because it’s the only half I’ve done. My favorite type of race course is a flat out and back. Hoping to make the Chicago Half my new favorite. I don’t have a favorite, yet, but I’ve spectated at the Midwest Bank half in Palos and I love Running for Kicks so I’ll go for that one! I have only run in Mel’s half marathon First Midwest Bank Half (twice), so have nothing to compare. Would love the chance to try a Chicago one.